Cosmetic Dentistry can change your smile & your self-esteem. Have you ever noticed that a person’s smile is one the first thing people notice? Is there something about your smile you would like to change? Have you ever considered Cosmetic Dentistry? Dr. Anthony Adams prides himself as one of the top dentists for Cosmetic Dentistry in Clearwater Fl. His patients will even tell you how he has changed there life by making it possible to smile again with cosmetic dentistry. If you are tired of hiding your smile due to lack of self-confidence call our office today for a consultation on cosmetic treatment. Cosmetic dentistry is such a broad term in dental treatment and can mean so many different things to different folks and their culture. There are many cosmetic dentistry options available, as well as each person should be treated individually, we talk over your age, overall health, your goals, financial state, different dental options, and the expected outcome, but every case is unique. Dr. Adams will ask what you want to accomplish with your smile and he will take the time to listen and educate you on your oral needs. 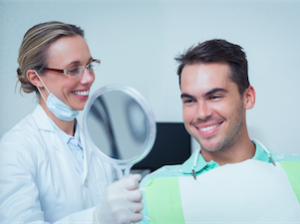 When it comes to cosmetic dentistry, we can help you with whatever procedure you may need. Healthy Body Dental is a full-service general dental practice and we have helped many patients living in and around the Clearwater, Dunedin, Largo, Palm Harbor, Safety Harbor, Tarpon Springs, Oldsmar and Tampa Bay Area. Please allow me to thank you, for your professional knowledge, and caring attitude. Not once during this whole process have I been uncomfortable or even felt pain. Your exact explanations, prior to each step gave me confidence in how you perform your work, with the perfectionist you demand of how the results turn out. Having explained the previous dental misadventures in my life, increases my gratitude for your abilities. Thank you seems so little to say, for the gift of smiles you’ve given me. With Appreciation – Bonnie M You’re #1 dentist of all time! May all the Good Blessing in life be yours. I want to thank each one of you for your kindness and help getting my teeth repaired. Each of you will always have a special place in my heart. You are one in a million. God really blessed me when he sent me to you. Here’s to a wonderful Thanksgiving. May all the joys of the season be yours. God Bless each of you. You deserve the very best always. Love JaRe & Bill thank each one of you for your kindness and help getting my teeth repaired. Each of you will always have a special place in my heart. After a recent fall on vacation, I was concerned about my top front teeth. After my first visit with you on my return home, I felt that you had a plan for the reconstruction that would give me the least discomfort and accomplish the job with minimum time and at a reasonable cost. I am very pleased with the results and I’m happy to say that the quality of my smile is now better than before the accident. I appreciate the gentle manner of you and your staff. Sincerely, Marcy S- I was concerned about my top front teeth, you had a plan for the reconstruction.